Yet another long (but necessary) intro to this trail guide. So please read carefully if you plan on hiking this trail, or just skip below to the pictures and report. 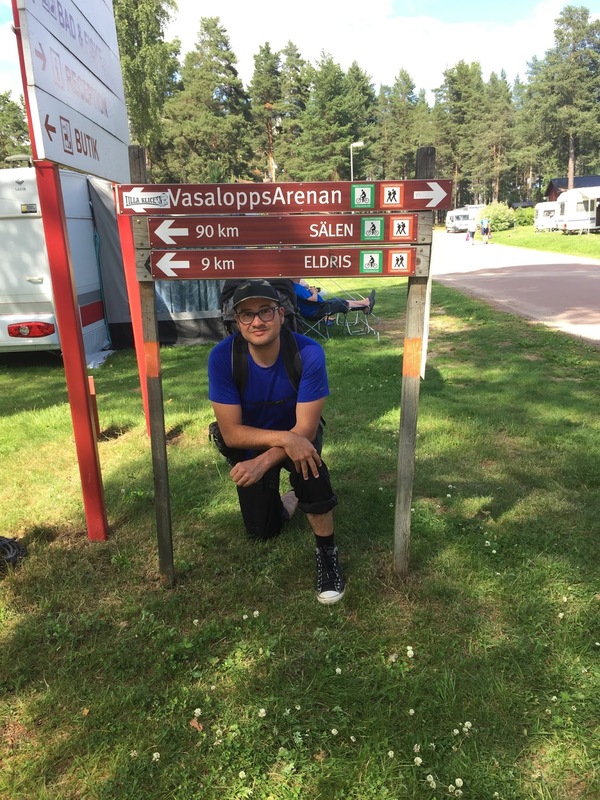 Vasaloppsleden is a 90km trail that follows a path similar to that of the Vasaloppet, which is the oldest, longest, and most popular cross-country ski race in the world. The trail does not have an official website in English (at least that I could find), but there is plenty of helpful information on the area, transportation, events, etc. on the official website of the various races (ski, bike, running) that take place there. All of the races as well as the hiking trail go from Sälen to Mora, however if you are hiking the E1 trails northbound (as I was) you will be walking from Mora to Sälen. There are various maps that you can buy of the area and the trail. The one I settled on is made by Calazo, and is generally quite a good map. There are three marked trails (for skis, bikes, and hiking) in the area that follow similar paths, but at times each trail will take its own route. Thus you can choose to follow the ski or bike trails at times while you are hiking, which is what we (my wife and I) did on our hike. Though in general I would recommend to mostly stick to the hiking trail, which caters more towards hikers, naturally. Public transportation to Mora is not much of an issue, with regular trains and buses passing through the town. However getting to or out of the village of Sälen is more challenging. There are only a handful of buses that go in and out of the small village (population 650! ), and you have to pay cash for tickets on the bus themselves unless you buy one of the local transportation cards. Sälen comes to life in the winter, when it hosts the starting point of the famous ski race, and when ski tourist pour in to ski in the surrounding mountains. But other parts of the year (like summer, when we were there) the village is well... pretty dead. There are a few shops and places to buy food and such, but everything closes early. There are several hotels and bed & breakfast places to stay the night, and are a bit on the pricey side. Along its 160 km, E1 travels on several local trails. All are not well marked, but there are rest shelters and huts. The trails go partly through mountain terrain that places certain requirements on the ability to use a map and compass. 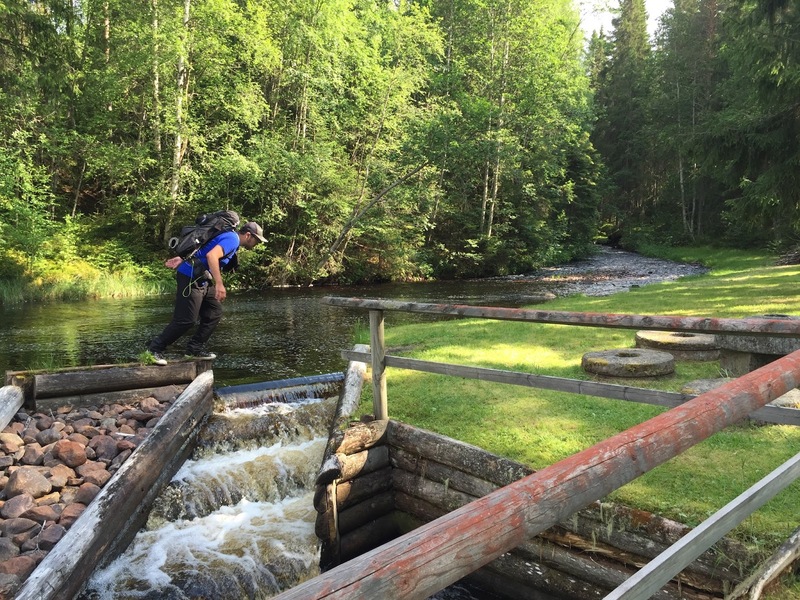 As the above implies, the end of the Swedish E1 trails presents certain challenges for section and thru-hikers alike. It is in a pretty isolated location area up in the mountains, so resupplying is going to be difficult or not an option around there. There are only a few buses a day that can get you back to civilization from Grövelsjön, the closest village being Idre (population 790! ), about 50 minutes away by bus. Mora is a three hour bus ride. 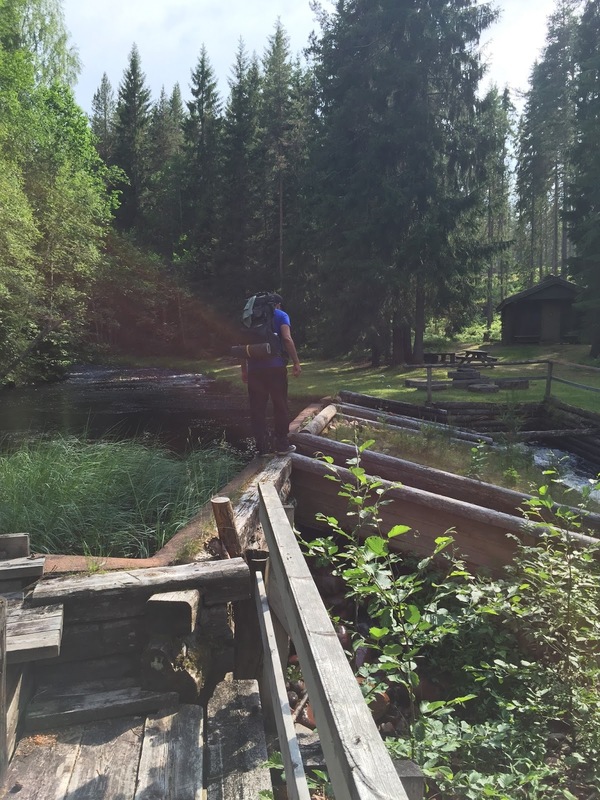 *Update 09/08/2016: I recently completed about half of the last part of the trail, going from Sälen to Mörkret. You can check out my report on this section here. 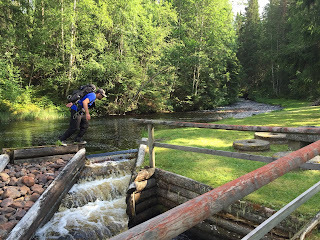 If you have not read the introduction to this trail guide yet, you can do so here, and there is also a list of links to other completed reports of the Swedish E1 trails. Please keep in mind this is still a work in progress. Now on to the guide! 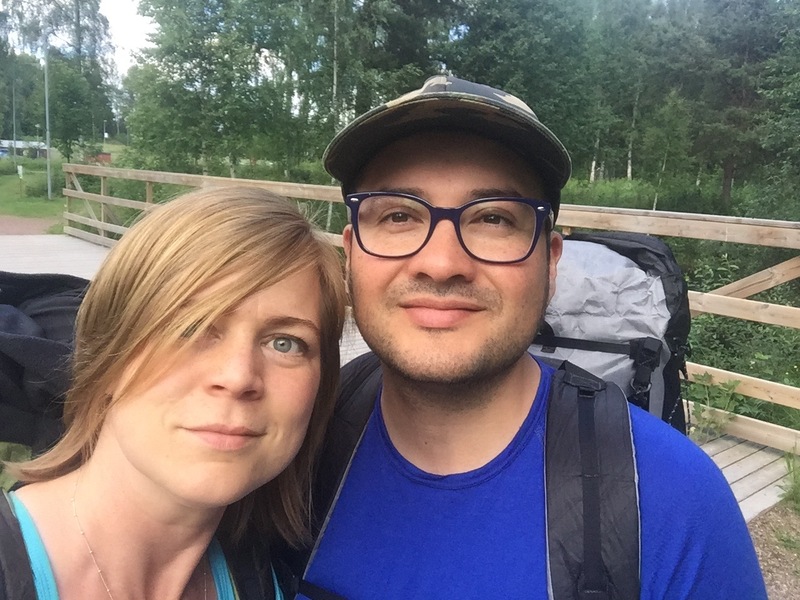 My wife and I hiked Vasaloppsleden together, and overall we really enjoyed this trail. 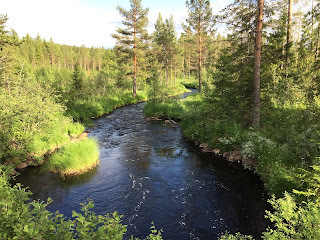 When I asked my wife to describe it with five adjectives, she said: comfortable, convenient, pretty, well maintained, and very buggy (as in full of bugs--we hiked the trail in the height of bug season here in Sweden, however). I agree with her assessment, but would add that its beauty is more of a cozy, quaint type of beauty rather than stunning views and vistas--though there are several good views of the surrounding mountains and bodies of water. Due to the popularity of this area because of the various races and the tourism attached to them, the trail is exceptionally taken care of. Well marked, many places to fill up on tap/spring water, eight cabins along with many simple trail shelters, plus several places to buy food and supplies. While it's possible to hike this entire trail and just sleep in cabins or shelters, of course it's still always a good idea to have your own shelter, because with many people traveling to the area, trail shelters may be full. However while we were there we only ran into a handful of backpackers (but many cyclists), and locals mentioned that springtime is the high season for hiking. The eight cabins are excellent! They all have wood stoves, several bunk beds, outhouses, water sources, outdoor benches and fireplaces, firewood, and even some tools to use. However if you choose to stay at one of these cabins it costs 50 SEK per person per night, and is based on an honor code. Hikers can either send a text message with their phone to pay or pay directly at tourist centers--there is more information on how to pay inside the cabins themselves. The simple trail shelters on the other hand, are another story. They are not terrible, but not that great either. Most of them are not really meant to sleep overnight in, but to stop and take a break in, say for lunch or snack. It comes off like, because the cabins are so great, the trail shelters have been kind of ignored and are at best a last resort for hikers to stay the night in. There are also a few bed & breakfast places you can rent a room at along the way, and a few campgrounds too. 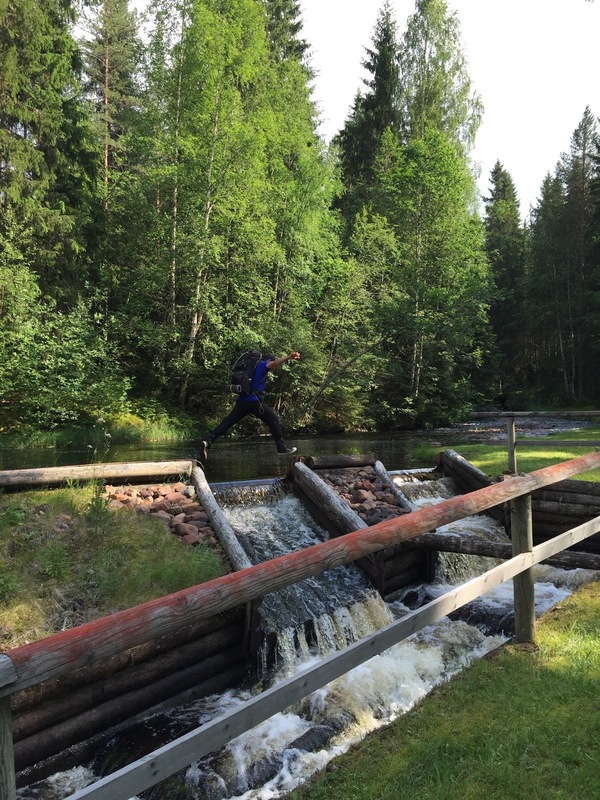 As noted in the introduction, there's not much in Sälen, but Mora has plenty to take advantage of as a backpacker. Lots of restaurants and shops (including at least one camping/outdoor type shop), supermarkets, pharmacies, etc. After getting into town by train, my wife and I took a nice stroll in the town center, which is pretty close to the train station, and got some lunch and a few last minute supplies. Oh, and the trail? You can't miss it. Once you continue on the trail through town, the path follows a river for a while and you're soon in the woods. The trail is wide and intersects with several other local hiking paths, such as Siljansleden. 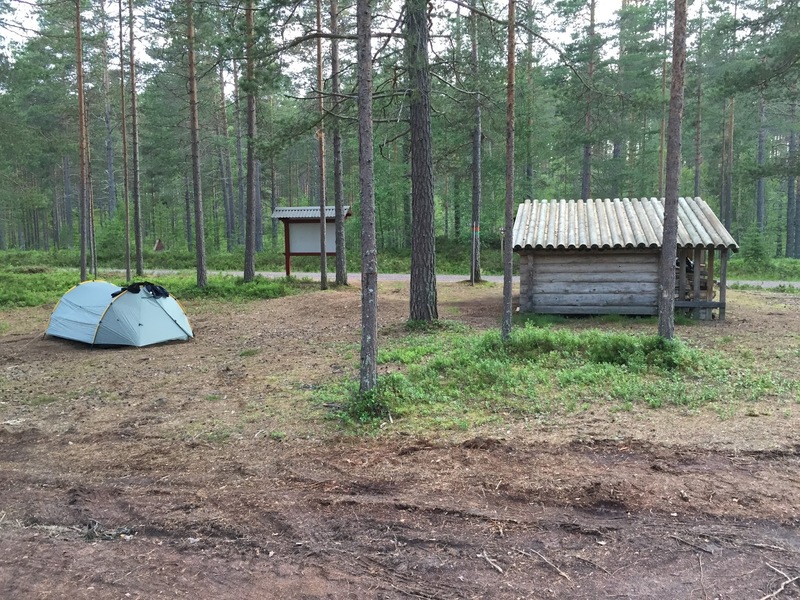 In not too long (about 10km from town) we found the first cabin, which is in a gravel parking lot, so it's not the most cozy or scenic place to spend the night. However this would be a great place to stay for someone arriving into Mora later in the day, rather than paying much more for a hotel. Close to the cabin is a water tap, and the water was cold and good. There are several of these official trail water taps, where you press a button to run the water. My wife and I wanted to spend the night at someplace that was more woodsy and cozy, so we hiked another 5km to a small hamlet of cottages called Läde. There is a trail shelter there, some flat ground to pitch tents and such near the trail shelter (which is what we did), a water tap, and my favorite part of this area was the public sauna right on the banks of a small river. Right after you pass a beautiful old stone bridge where the river flows under, there is a small side trail off the road that takes you to the sauna. The sauna has a wooden dock that is built right over the river and has a ladder that goes into the water, where it is deep enough to swim. It was too warm for a sauna, but perfect for a quick dip. Past the shelter is a nice little mountain with an alright view you can climb up on the way to the hamlet of Hökberg, where there is a water tap and an outhouse. 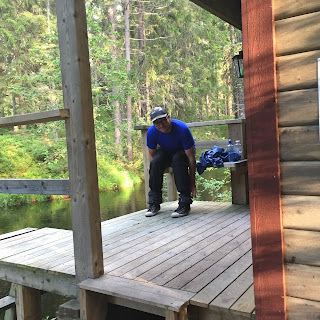 Soon after is a trail shelter near a pond, then another cabin where we stopped to have lunch, and near the cabin is a stream. There are two more small hamlets on the trail as you hike through the wide, well cleared trail continuing north-west: Gopshus and Oxberg. Both have water taps as well as places to rent a room for the night if you are so inclined, Gopshus has a trail shelter, and Oxberg has a gas station where you can buy simple treats like ice cream and candy. 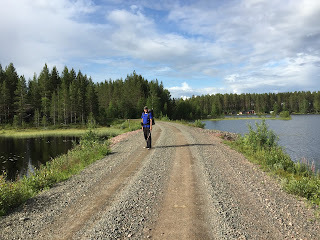 In Oxberg we decided to follow the green-marked cyclist trail on the road going west because we wanted to go for swim in the big lake Oxbergssjön. There is a nice dock there, an outhouse, and changing huts on the easter shore of the lake, and made for a pleasant break for a swim. 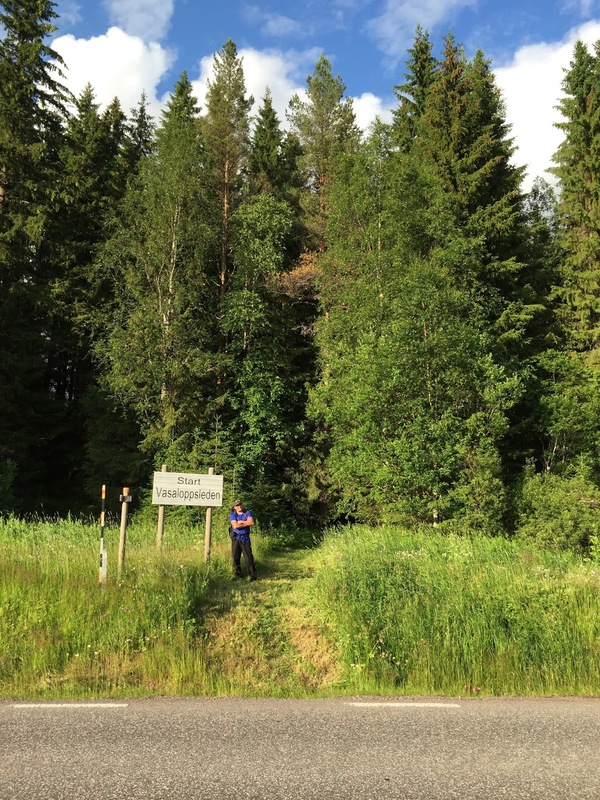 You can easily pick up the trail about 1.5km further along the road, where there is a small driveway that goes south and intersects with the trail (you should be able to see the orange trail markers from the road). 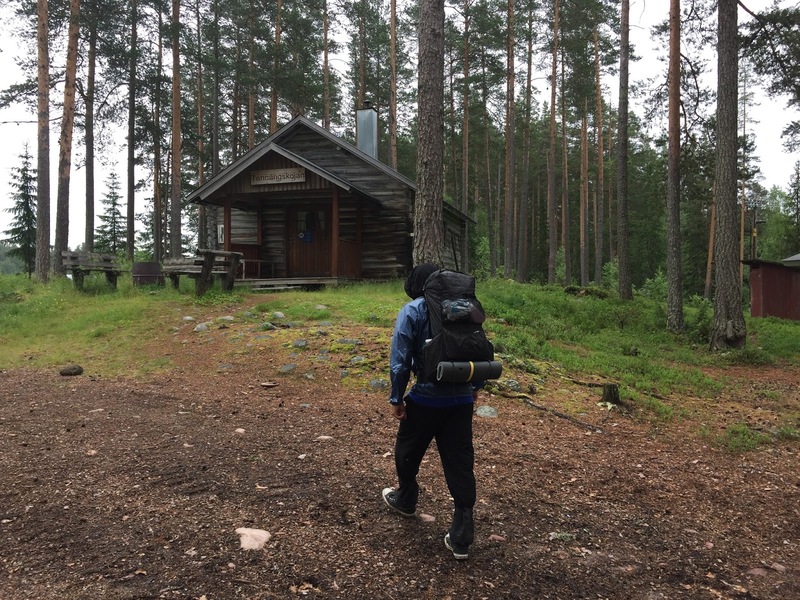 About 1km past Oxbergssjön was one of my favorite parts of the trail, the cabin Axistugan, where we spent the night. I'll let the pictures do most of the talking. One of the best spots I've ever camped out at. The next day we hiked on and noticed a change in terrain that would linger on and off for the rest of the trail, which was larger bog crossings. The bogs are also well maintained and have good planks or even gravel roads built through them. My wife and I really enjoyed these bogs in spite of all the more bugs around. Our feet stayed dry on most of the trail, and the bogs, with their tufts of bog cotton and still waters, have their own harsh beauty. There are a few somewhat ramshackle trail shelters on the way towards the small village of Evertsberg. 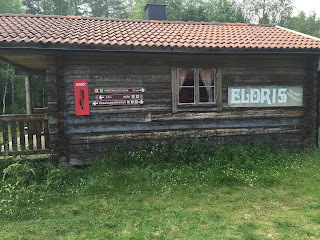 Arriving in Evertsberg, we were reminded that in this area (and also in and around the village of Älvdalen), a unique dialect of Swedish is spoken that many regard as a separate language altogether, known as Elfdalian. 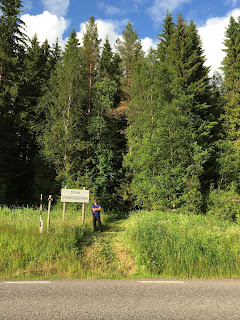 It is only spoken by about 2,000 people in this area, and on road signs in Evertsberg there was both Swedish (above) and Elfdalian (below) text. We passed by the first backpackers we encountered on this trip here, who let us know that the hostel and café in Evertsberg was closed down for reasons unknown. The bathrooms and water tap behind the hostel remained open to the public, however. 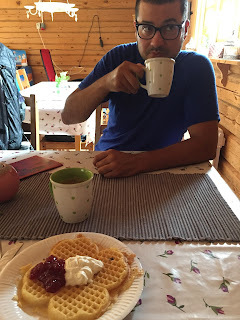 My wife and I had planned on getting a cup of coffee there and maybe a snack, but just a few kilometers west is a campground with a café, so we got our coffee and snack there instead. Past the campgrounds now moving west by south west, we passed a few trail shelters, another cabin, a water tap in a parking lot, and the hamlet of Rishorn, where there is yet another cabin. Feeling "in the zone" of putting some solid hiking in, we decided not to spend too much time at any of these places, with our goal of the hamlet of Tennäng, where we would spend the night. We decided to mix it up a bit and follow both the hiking trail and cycling trail, and were happy with the results. In Rishorn there are some very quaint parts of the trail, where it gets very narrow at times and is surrounded by lush vegetation. And on the road to Tennäng there is a nice view of the valley ahead, plus it's a more direct route. 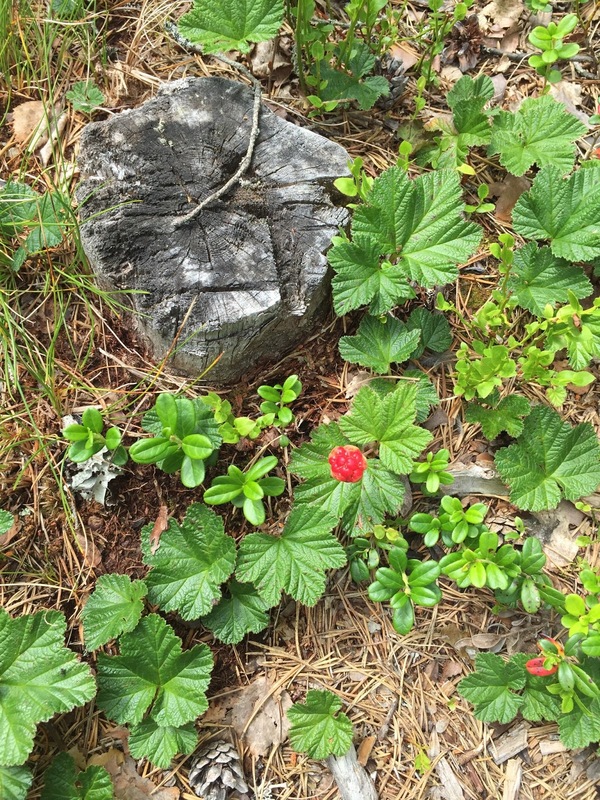 On this part of the trail we began to notice a lot of cloudberry plants growing, but none of the berries were ripe yet, so we didn't pick any. It's an acquired taste. I don't like them in spite of my best efforts of eating them raw, cloudberry jam, the jam with ice cream, etc.--it's just not my thing. But my wife loves them, and like most Swedes she grew up with it. There is a cabin in Tennäng, where we ate dinner before deciding to sleep outside in our tent, as well as a water pump (one of those old hand-crank types where the water comes up from a well). There are a few slow moving rivers that go through Tennäng, and that combined with abundance of bogs around, this was the worst place for bugs on our whole trip. Whole clouds of mosquitoes and midges tried their best to eat us up (and did a bit), but with our head nets, windbreakers, and using the cabin and our tent carefully, we were able to keep them at bay most of the time. The next morning after packing up, we quickly made it to the hamlet of Mångsbodarna, where we ate a nice 2nd breakfast (hobbit style!) and drank coffee, and also filled up on water again. In addition to the push-button tap available here, there is also spring water (look around past the first few houses for a pipe with flowing water). We opted for the spring water, and it was cold and good. There's also a really nice bathroom at the café, where you can pay a small fee and take a shower if you want. After eating we noticed that our luck with the weather had run out. We had sunny days up until then, but after leaving the café it began to rain and dark clouds moved in. Drizzle turned into very heavy rain, which briefly turned into hail for a spell, then to steady rain as we made our way to the next cabin where we would stop for lunch. It was warm enough that I didn't even bother to put my rain gear on, and the rain felt refreshing--plus I was starting to get a bit stinky anyhow. 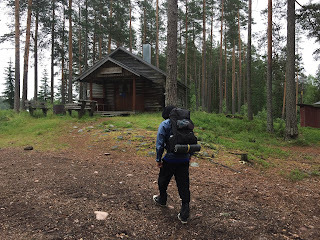 Due to the weather we didn't take any pictures between Mångsbodarna and the cabin Skärloksstugan, but just before arriving there the rain stopped. Approaching the cabin we noticed smoke coming out of the chimney, and inside two friendly backpackers had the wood stove going and were busy drying off their clothing and making lunch, so we did the same. The backpackers mentioned that there was an annoying mouse infestation at the next cabin, which is where they had stayed the last night. My wife and I were thinking of spending the night there, but after hearing about this, my wife was a bit turned off to the idea. 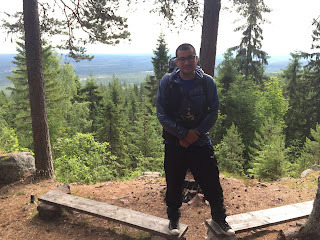 So we made tenative plans to try and put in a big hike all the way into Sälen. After eating lunch, the cabin was toasty warm, and our clothing was pretty much dried out, so we wished the other travelers well and moved on. 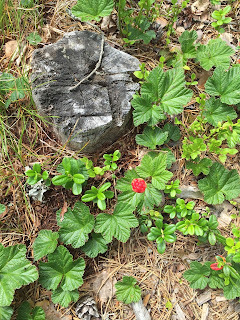 For a while the trail had more pretty bog crossings, many more unripe cloudberries, and eventually intersected with a road that not only goes to the last cabin on the trail hiking northbound, but also goes all the way to the start/end point of the trail via the green marked cyclist trail. 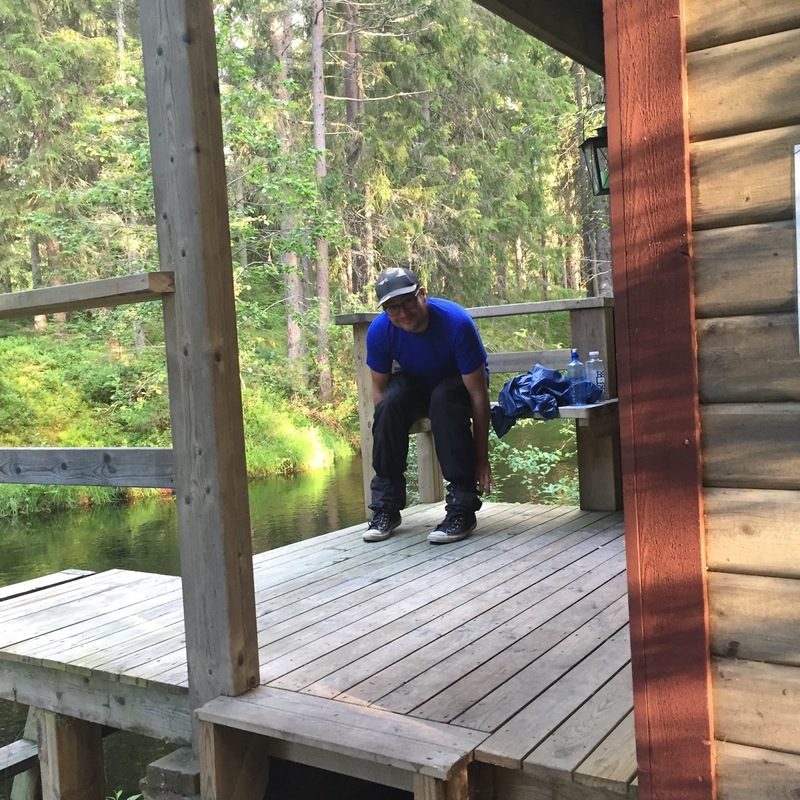 So we arrived at the Smågan cabin, ate dinner, and while I was washing out our cook kits in the lake nearby, my wife sat in the cabin and listened to all the mice scratching around inside the walls of the cabin. 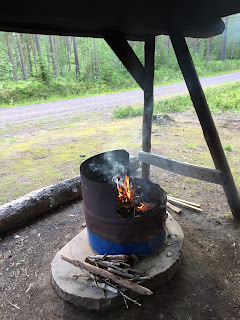 This was enough for her to decide to go for one last, big day of hiking all the way to the end of the trail and then to Sälen where we could get a bed & breakfast for the night to spoil ourselves. 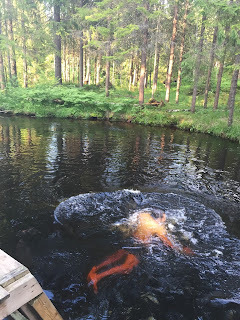 Taking the green trail also avoids you having to backtrack about 1.5km following the orange hiking path at the beginning of the trail if you are heading towards Sälen. So that's exactly what we did, following the green trail to the start/end of Vasaloppet/Vasaloppsleden, and the hike actually ended up breaking my old record (37km / 23mi) for most kilometers hiked in one day. Total we hiked 39km / 24.2mi to our B&B in Sälen, and the next day after breakfast got a bus to Borlänge where we could catch a train home. Finishing this trail was a bit bittersweet for me, but mostly sweet. 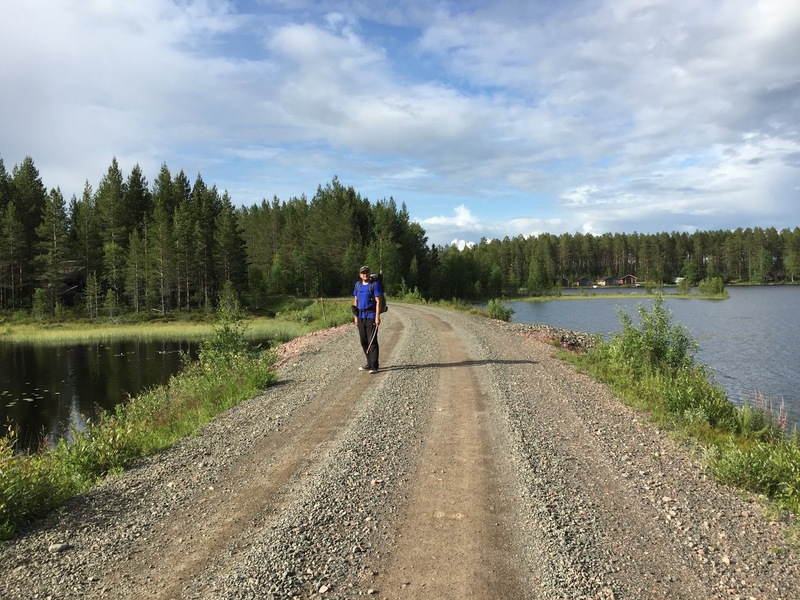 I am nearly finished with the entire Swedish E1 trail system, with only 160km left to go from Sälen to the Norwegian boarder near Grövelsjön, where the E1 continues into Norway. However due to the complications with getting to and from this final stage, I am not going to have the time to do it this year unfortunately. But next year in either late spring or early summer, I plan on going back up there and finally finishing this project of mine. Until then, I will be revisiting some of my favorite parts of the E1 closer to home in the meantime, and will continue to do updates and additions where possible. So check back for more trail guides and such in the future, and happy trails to you.